There are many ways that you can help Molly. First, remember that what you are actually doing is helping your neighbor, the person who might be living right next door. For further information, please contact Bill Rae at 207-126-3254. Volunteers are a vital part of our ministry! If you have an interest in helping us, please take a look at some of the things that we need help with.Kappa Delta Phi, Kappa Lambda Chapter, from Husson College, is one of many regular volunteer groups and is also a generous financial contributor. 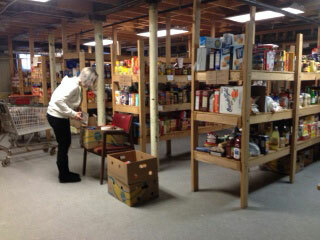 Volunteers are always needed to stock shelves and prepare bags for distribution at our food pantry. Every day we need volunteers to help with the meals. People come to Molly for an evening meal at 4:15, Monday through Friday; this is when we need help serving the evening meal. We don’t have an age requirement; we just ask that you are tall enough to see over the counter. Volunteers put food on plates, serve the plates, and walk around to our guests and pour milk. We want our volunteers to interact on a one-to-one basis with our guests. This helps to break down stereotypes that the volunteers and guests may have of each other. It is fun and very rewarding to go home knowing that you did, indeed, make a difference. We welcome individual volunteers, or groups from churches, schools, businesses, etc. During the day there is always cleaning that needs to be done and errands to pick up food and donated items. The shelves in our food cupboard need to be stocked and bags need to be filled to hand out to families and individuals three times a week. In the summer we have gardens that need to be tended. Sometimes there are other types of groundwork around the premises including painting and general maintenance that need to be done. Food is always needed. Food drives are an excellent way to provide service to Molly and the community. Perhaps your church, social group, business, or family could support us through a fundraising drive. Be creative and think of new ways to collect or raise money to buy food items for Molly, or if you’d like to be part of one of our existing fundraisers, please call us at 207-126-3254. We welcome donations of food, clothing in good condition, and financial support, great or small. Every little bit helps and is put to good use providing food in a safe and warm building. Your monetary donations allow us to provide for individuals and families who have to choose between feeding and clothing themselves and paying for heating, utility bills, rent, medicine, gas, and personal items. Remember that donations are tax deductible. Molly Ministries is a 501 (c) (3) non-profit corporation established in 1991, in Bangor, Maine. Donate Online securely through our website. Molly also accepts stock transfers. Call Bill Rae at 136-6541 to donate stocks or for more information. Sometimes people may have constraints on their time or finances which keep them from assisting us as much as they’d like. If this is the case for you, you can still help us by praying for us! We need the strength your prayers provide! For more information about our Soup Kitchen, Food Pantry, a Food Drive, or Volunteer opportunities, please call us at 207-126-3254.